I actually didn’t know The Anchor served food nine months ago. We hit the bar on a pub crawl, and ordered beer. The sad thing is I think I even looked at their site when setting up the crawl. I don’t know if their food wasn’t as prominent or if I was in a tunnel vision drinking state of mind. My guess is the latter. Anyway, now I go to their site and am overcome by all of the delicious food pictures! Anyway, we ate there on a Sunday afternoon. The place was fairly busy but not swamped. I think there was only one waitress working on the half of the restaurant we sat in (the restaurant is divided into two parts). My only complaint was how long it took for the food to arrive, but that was mostly because we had a hungry (read: grumpy) 2 year old with us. Otherwise, I typically don’t mind waiting for food if it’s not over a work lunch hour. Kristy and I checked out the menu and were immediately overwhelmed. There were so many choices, and we’re not very decisive. But, first we put in Luke’s order. They have a good kid’s menu to choose from. Luke got a peanut butter, honey and banana sandwich. He got fries and applesauce with it. He’s not used to honey or bananas on his peanut butter sandwiches, but he loves sweet stuff, so we thought this was a winner. Luke’s lunch. 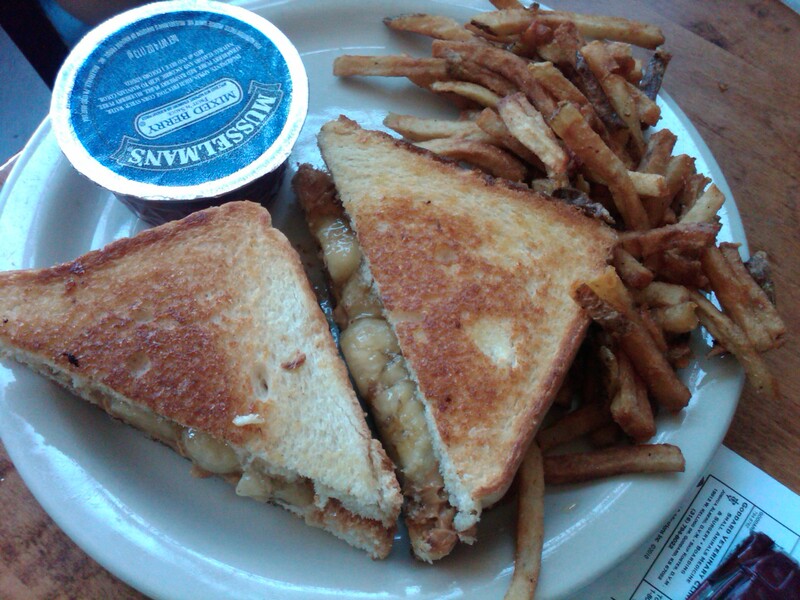 Peanut butter, honey and banana sandwich with fries and applesauce. Big enough for any kid I know! It was definitely a tough feat to conquer for someone so small. Kristy ended up taking off the top piece of bread and having him eat it like toast. But this kid’s menu could definitely cater to children of all ages, so we’re not complaining about anything. Luke didn’t share his applesauce with me, but I tasted both the sandwich and fries. I would have been pleased to have them for my own meal! Luckily, though, I ordered for myself! I chose a Pub Grilled Cheese sandwich with sweet potato fries. Kristy got the Chicken Pesto sandwich with chips and mild salsa (you can choose mild or hot). My grilled cheese came on Italian bread with havarti and cheddar cheese. I’m rarely disappointed with anything with melted cheese, and this did NOT disappoint. YUM! Melted cheese between two perfectly toasted pieces of bread? Yes, please! Despite my queso-tastic bliss, I was glad I shared with Kristy. Her Chicken Pesto sandwich also came on Italian bread. It had grilled chicken, red onions, roasted red peppers, artichokes and provolone. Delicious. And the chips and salsa side went perfectly. I forgot to mention the sweet potato fries. 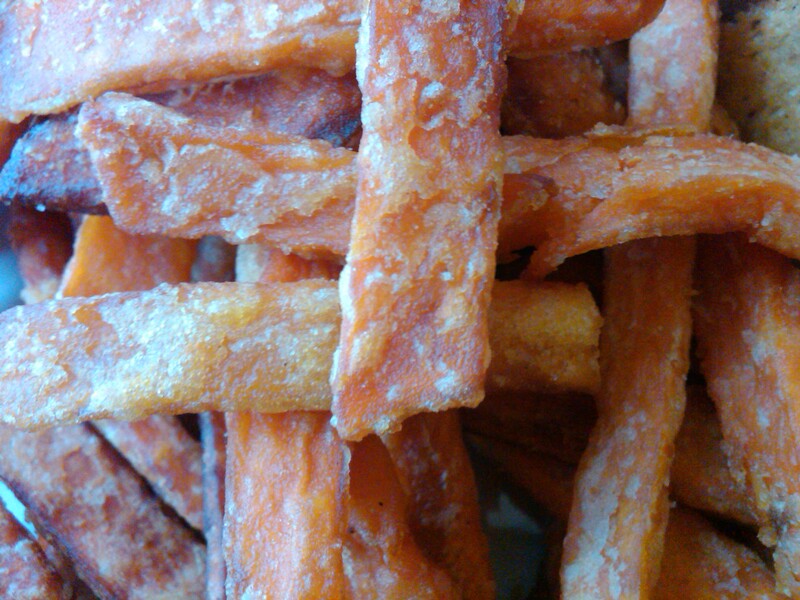 Oh, homemade sweet potato fries. I love you! And for all of you vegetarians out there, they have a great selection of vegetarian food! I believe they have a separate vegetarian menu as well. Check out their website (under eat) to see it. 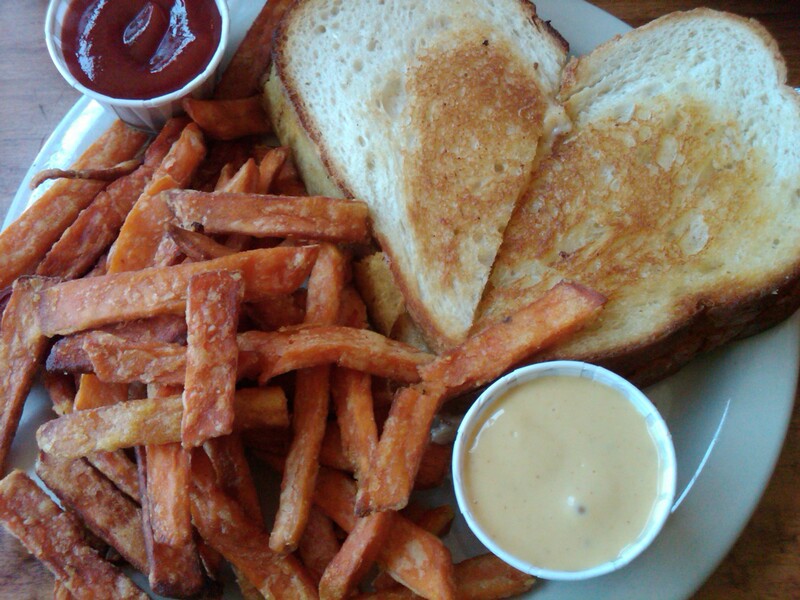 Pub Grilled cheese with sweet potato fries. I always get a side of honey mustard with sweet potato fries. This plate screams “perfection.” No? 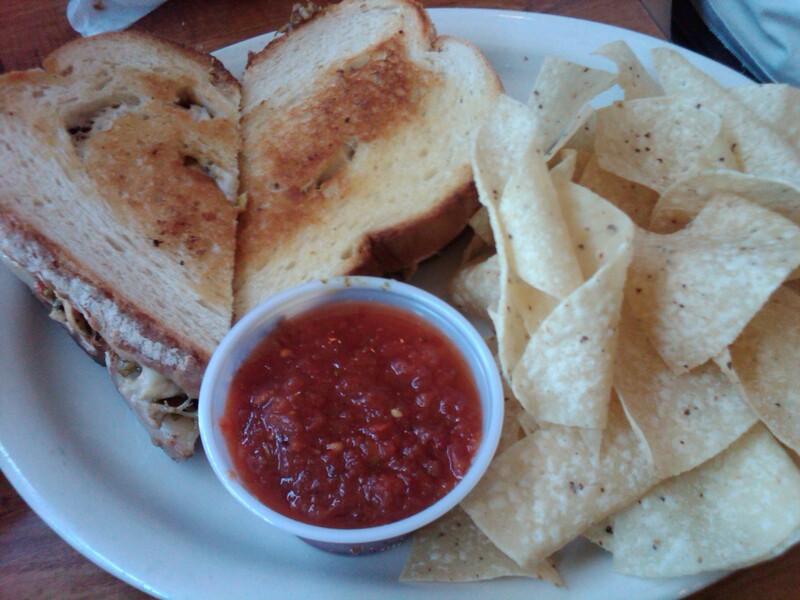 Pesto Chicken sandwich with chips and salsa. I could have eaten chips and salsa all day long! 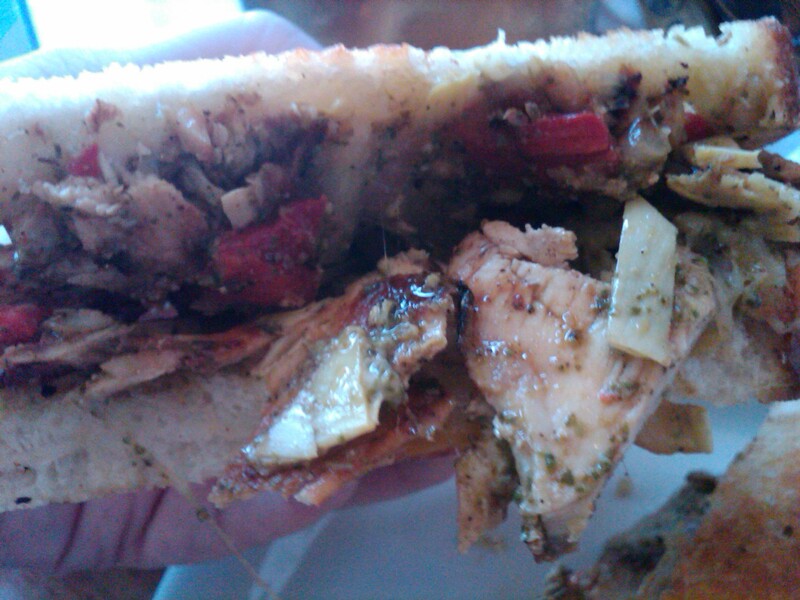 Inside of the Chicken Pesto sandwich. These are the fans Luke was obsessed with. 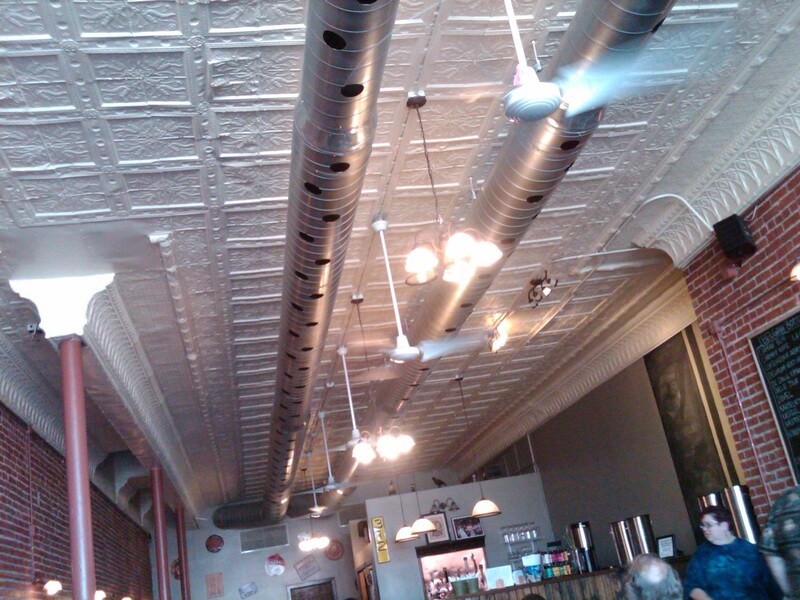 Originally I took this picture for posterity’s sake, but realized it was an OK shot of the inside of the building. Bottom line: GO! It’s wonderful. Even though it’s pretty slow, the service is great. Everyone was really nice to Luke, and very patient with Kristy and me being indecisive. Dude… Mat and I LOVE The Anchor!!! Sooooo good. We like the Hell Hath No Fury Sub.. Mmmmmmmmmmm!!! Oh and they have a steak special on Saturdays. That’s awesome too! YUM! That sounds good! Kristy and I didn’t see anything beyond the sandwiches. I definitely want to go back and try their queso. So next time you go (that you want a guest), invite me and I’ll try that out with a few beers. God, that sounds SOOOOOO good! Their salsa’s really good. We’ll have to try hot! It was soooooo good. I will definitely be going back. I can’t believe I’d never heard of it before. I”ve heard of it but never eaten there. Mmmm, I’m hungry. Yes, I’ve been wanting to go there since Karla told me about it a month or so ago! YUM!